Simon "DaDumon" Grabenschweiger historically outlasts 253,698 entrants in the the Common Cents Kickoff to win $10k. 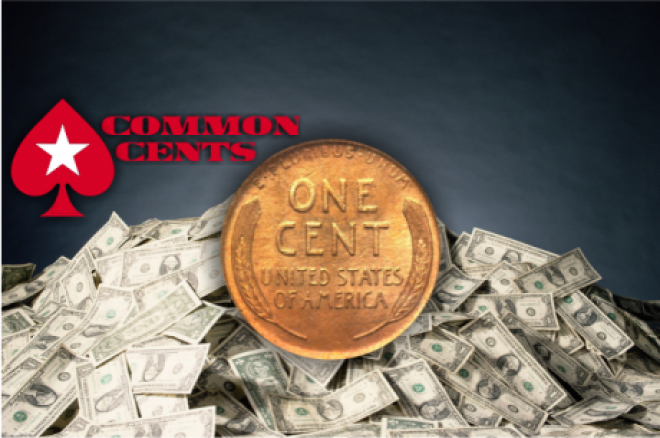 PokerStars generously contributed $97,463.02 to meet the posted $100K GTD prize pool in Common Cents Kick-Off. As announced a couple of weeks ago in the PokerNews BlogNews Weekly, PokerStars set a new record for the most real-money tournament entrants in a single tournament on Sunday, Oct. 4 when 253,698 entered the Common Cents Kick-Off, the opening event in the inaugural Common Cents poker festival. The previous record of most entrants in a single tournament also belonged to PokerStars, when in June 2013 during the Road to 100 Billion celebration, 225,000 players ponied up the $1 buy-in to play in the PokerStars Guinness World Record Attempt. With a buy-in of just $0.01, the tournament made it affordable for players, no matter their bankroll, to play in the event. Additionally, the tournament provided tremendous value to the over a quarter of a million entrants with the site generously contributing $97,463.02 to meet the posted $100,000 prize pool guarantee. I was playing a lot of other MTTs and totally forgot I registered for this a few days before. Austria's Simon "DaDumon" Grabenschweiger etched his name in the history books after navigating through the huge field in the tournament to win the $10,000 top prize. It took Grabenschweiger just under seven hours to accomplish this feat thanks to the tournament's turbo-format. Grabenschweiger is no stranger to poker, accumulating over $700,000 in online tournament cashes according to PocketFives.com and over $30,000 in live tournament cashes according to The Hendon Mob. The Austrian poker player's biggest cash came just more than a year ago when he took fourth place in the PokerStars Sunday Million on July 27, 2014 for $76,241. The PokerStars Blog recently discussed the win with Grabenschweiger, and as you can imagine, he was excited about turning just one cent into a five-figure payday sharing after the win, "It was Awesome! I couldn't believe it!" Grabenschweiger's big score almost didn't happen, since he almost ignored the tournament entirely while playing a dozen tables of bigger buy-ins events, seemingly oblivious that he'd registered the Common Cents Kick-Off days before. "I was playing a lot of other MTTs and totally forgot I registered for this a few days before," Grabenschweiger explained. "When it popped up I actually tried to get rid of it because I had 12 other tables running. I assumed it would be a lot of players, maybe even more then there were. The tournament had a huge overlay." Thankfully for Grabenschweiger he did take the event seriously, and with just 300 players left he felt he had a good chance with very few - if any - regular players still in the event. Grabenschweiger elaborated on this point stating that, "With that many players there were almost no regulars at that stage of the tournament, and even though the decisions are pretty easy from a mathematical point of view a lot of players are very inexperienced dealing with such short stacks. I was very confident in my abilities and had the run-good to back them up." Lady Luck was also on Grabenschweiger's side, especially on the final table. Grabenschweiger shared with the PokerStars Blog that, "On the final table every hand I won was a key hand I'd say. When we were four players I jammed from the small blind vs the big blind who was third in chips by quite a bit with Q3o, and flopped a Q. The short stack busted a few hands later when he shoved into my big blind and I called Q5o getting better than 2-1 and flopped a Q again. Both hands play themselves. Some people on the rail were thinking differently though." The PokerStars blog shared that Grabenschweiger celebrated his win by enjoying two beers. He appeared in awe that he outlasted this massive field sharing, "I mean no one could ever imagine winning a turbo poker tournament vs that many players. And I guess no one turned one cent into $10k in under seven hours before. I mean how would one approach that? That's one million times the buy-in. Nice ROI right there." For more information, be sure to head on over to the PokerStars Blog.